This post is sponsored by Little Partners. We are headed into my favorite time of year. I love Thanksgiving and Harvest and teaching my children about gratitude, pilgrims and the fun things too, like turkeys. 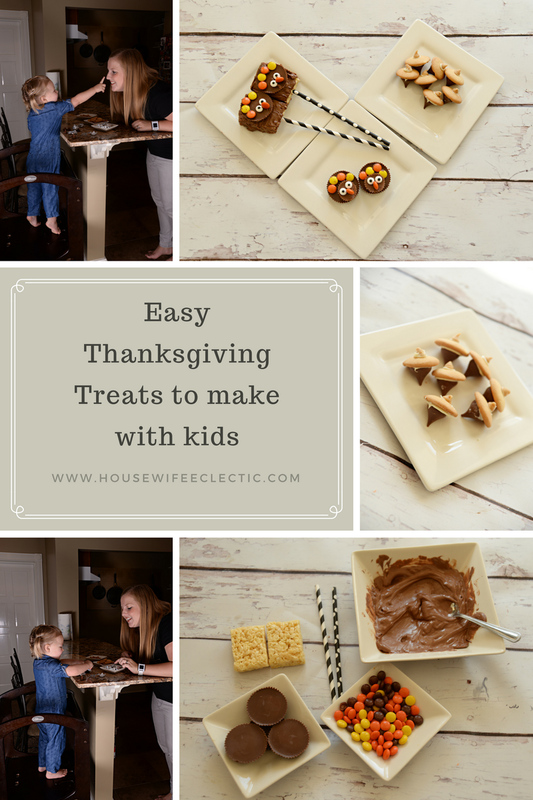 I often feel like we skip right from Halloween to Christmas, so I try to spend time making Thanksgiving crafts and recipes with my kids so it feels like its own distinct holiday. My two year loves to help cook and these candy creations were absolutely perfect for her skill level. 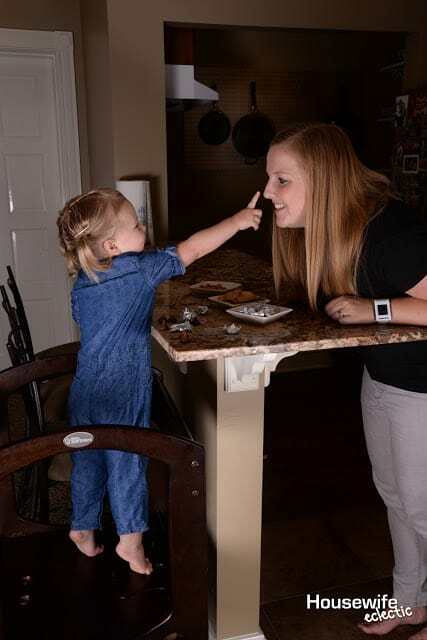 She helped unwrap candy and dip things in chocolate. We made three different treats, acorns, Peanut Butter Turkeys and Rice Krispie Turkeys. This is absolutely the perfect time of year to make these treats. 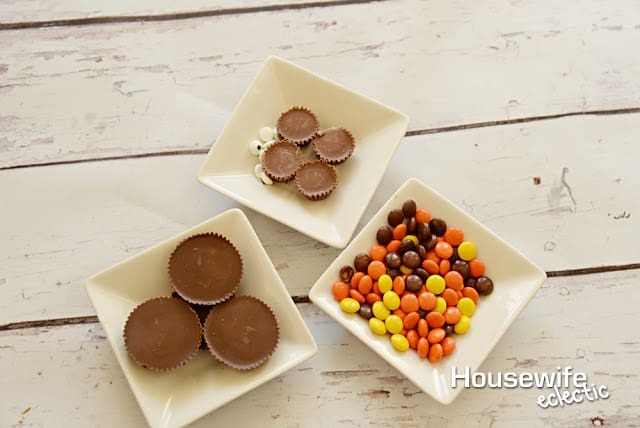 Just raid your kids Halloween candy for the supplies you need! Dip the bottom of a kiss in the chocolate and then place it against the flat side of the wafer. Dip the bottom of a peanut butter chip and place it on top of the wafer. Allow the chocolate to set before serving. 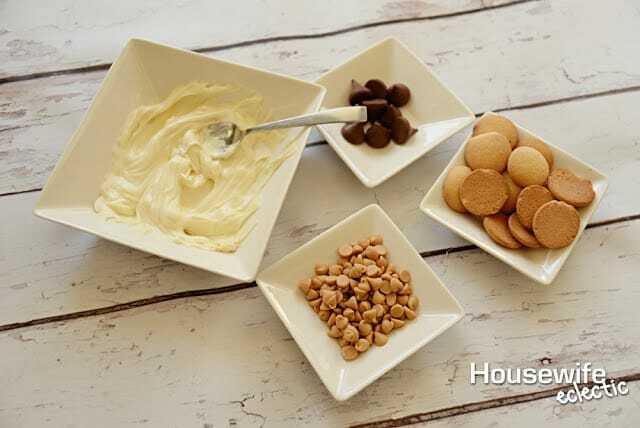 Place a handful of melting chocolate in a microwave safe bowl and microwave for 1 minute. Stir the chocolate microwave in 30 second intervals stirring between each one until the chocolate is smooth. 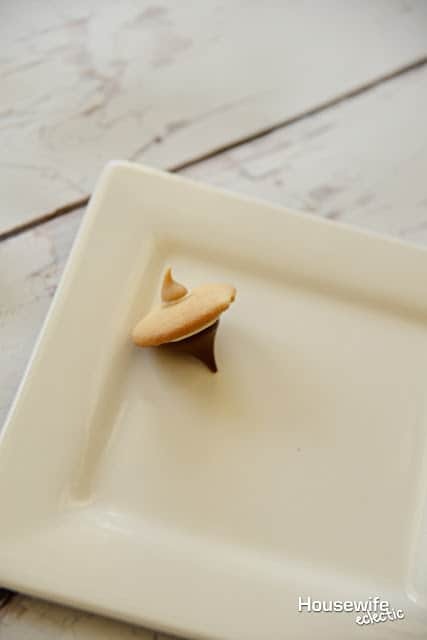 Dip the bottom of a small peanut butter cup in the melted chocolate and then place it on top of the large peanut butter cup towards the bottom. 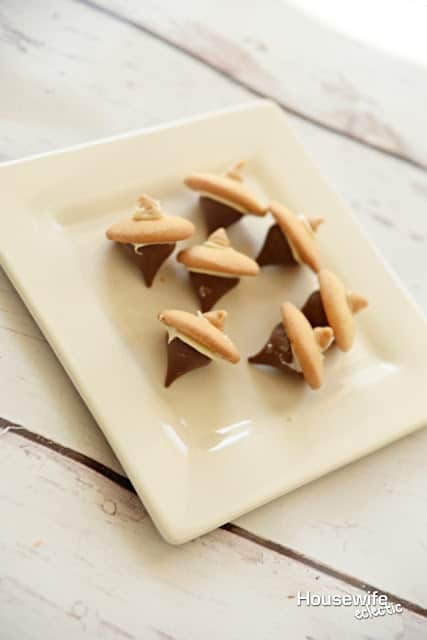 Dip the back of a orange peanut butter piece in melted chocolate and place on the large peanut butter cup. Repeat with a yellow piece. Add the eyes to the small peanut butter cup by dipping the backs of them in melted chocolate and add a beak with a peanut butter piece on its side. Allow the chocolate to set before serving. 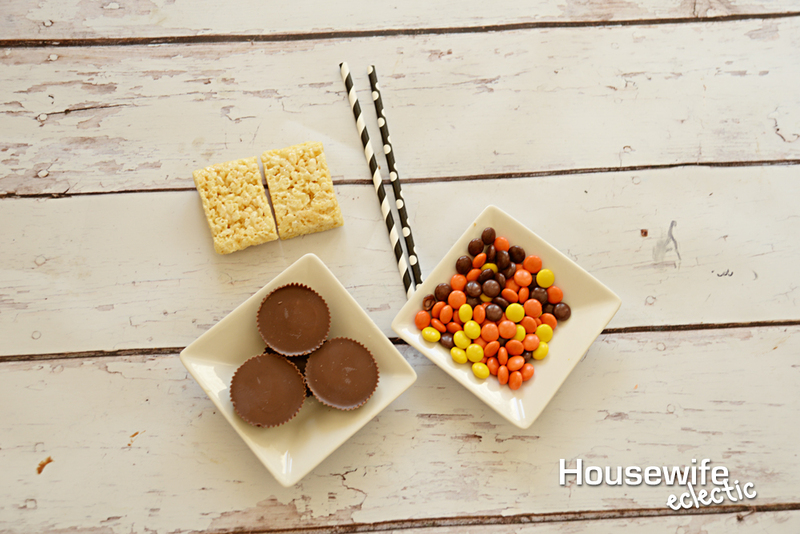 Push the paper straws through the krispie treats to act as the sticks. Place a handful of melting chocolate in a microwave safe bowl and microwave for 1 minute. Stir the chocolate microwave in 30 second intervals stirring between each one until the chocolate is smooth. 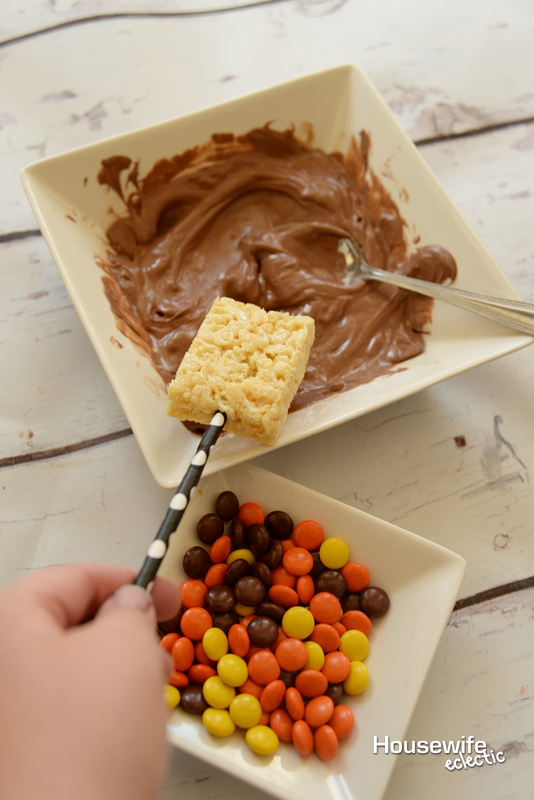 Dip the rice krispies in the melted chocolate, making sure to cover both sides of the treat. 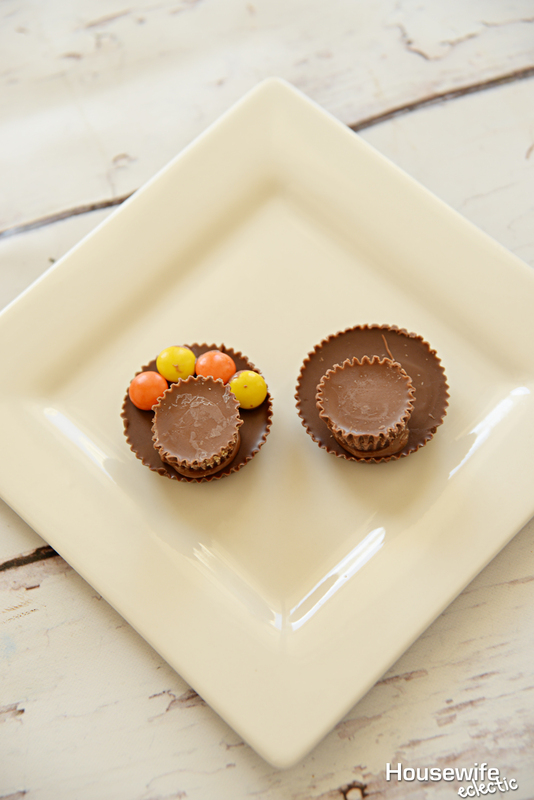 Place a peanut butter cup on top of the treat as soon as you are finished dipping it. 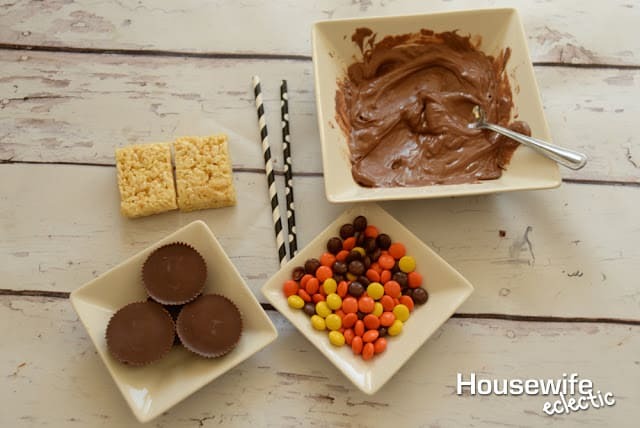 Dip the back of a orange peanut butter piece in melted chocolate and place on the large peanut butter cup. Repeat with a yellow piece. Add the eyes to the small peanut butter cup by dipping the backs of them in melted chocolate and add a beak with a peanut butter piece on its side. Allow the chocolate to set before serving. Whenever my daughter and I cook together in the kitchen, we use her Learning Tower from Little Partners. It allows my daughter to be independent in the kitchen while allowing me to know that she is safe. 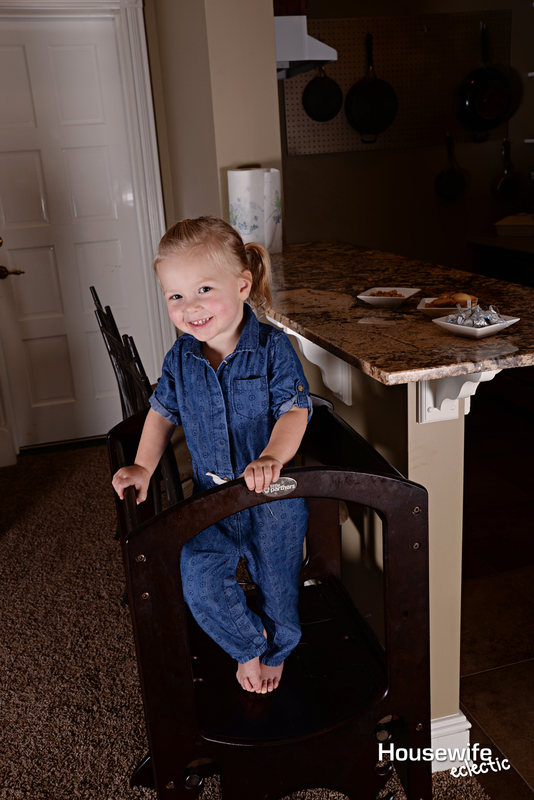 Unlike traditional step stools, it has sides rails to keep her safe. It is strong and sturdy and doesn’t slide around like most step stools. The way that the tower is built allows me to place is flush against my counter which helps saves space and makes it so she can reach easier. She loves her Learning Tower so much that she prefers to eat her breakfast and lunch in it while standing. 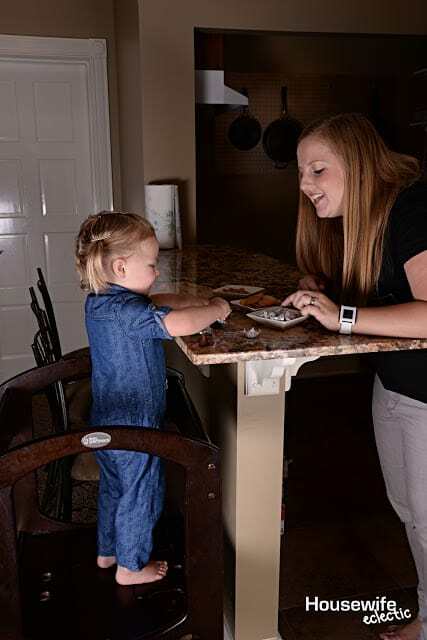 It lets her be the right height for the counter instead of seated on a stool. 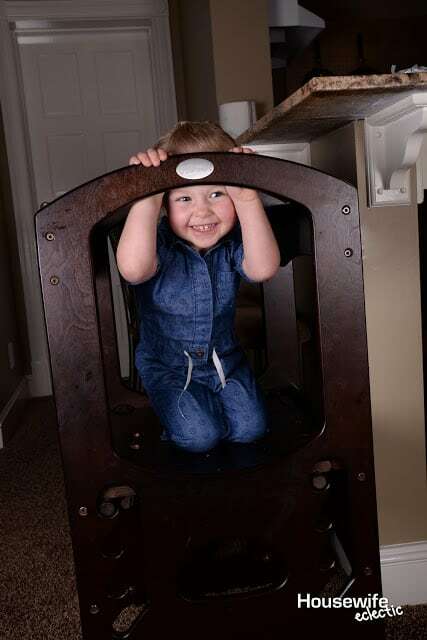 The Original Learning Tower is built to allow toddlers to climb in and out of it easily. 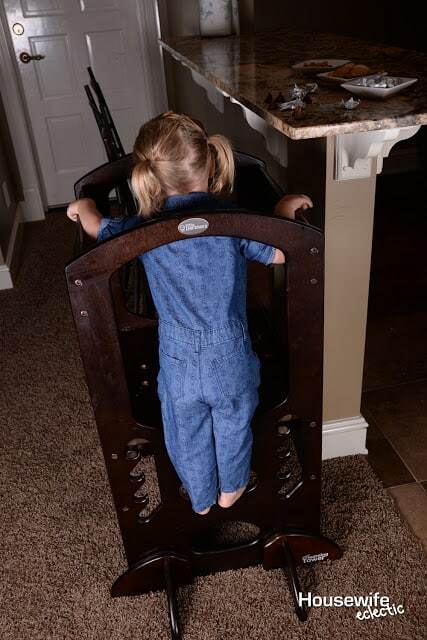 The adjustable height on it makes it perfect for kids as young as 18 months and all the way up to six years old. My absolute favorite thing about this piece beside the safety it provides for my daughter at the counter? It is pretty! I feel like so many children companies don’t take into account that their furniture is going to be in my kitchen where I am going to see it every day. 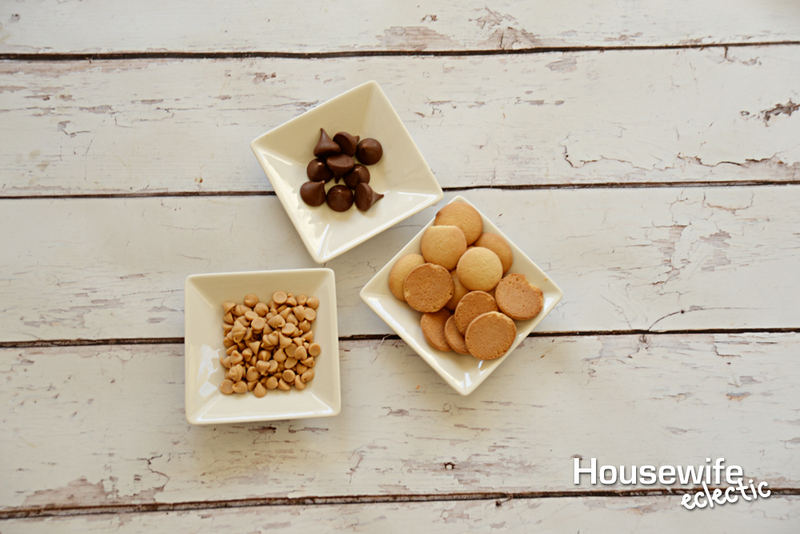 Little Partners makes so many different finishes so you can match it to your kitchen. It looks like an extension of my kitchen instead of an eyesore. My daughter’s favorite part of the tower besides being able to see at the counter? Throw a blanket over it and it makes the world’s easiest fort! She place castle all day long in her learning tower. A helper tower is our most used piece of furniture in our house. Our girls love to help us cook and it helps so much! I made turkey cupcakes last year, these are cute ideas for this year! These are super cute and I bet they are yummy. I want to make these treats with my twin granddaughters. All the activities are adorable! Your daughter is a sweetie! My "little" is 31 now, but she loved doing these kinds of activities! It makes me sad that so often Thanksgiving is skipped over because people rush ahead to Christmas 🙁 I'm loving those Rice Krispie Turkeys…so cute!!! I love that you celebrate harvest as well. I immediately thought your daughter was so cute in that leaning tower, what a perfect creation! 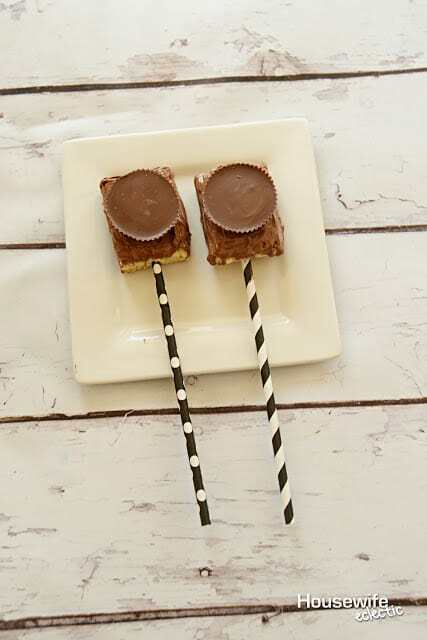 You've done it again- these treats look like so much fun! I NEED one of those learning towers!! These look amazing! My kids had so much fun making Halloween treats. They would absolutely love making these ones! They look really tasty too! I would need a lot of extra ingredients for these snacks! And I definitely need one of those towers! I have never heard of a helping tower this looks so cool! Love those acorn looking cookies very clever! ooo these would go down really well in our house! I love the peanut butter turkeys, they would probably be the husbands favorite while the turkey chocolate sticks would be my little guy's choice I think! Kick out of those. So need to make! These treats are adorable and they are perfect for the fall and the upcoming holidays. My boys and nephews would love these if I served them during the holidays. My toddler is always begging to help me in the kitchen. This is a great way to have her involved without making something that could be dangerous! So cute! It's so cute that she stands on the chair to help you. These are cute ideas. My son is always ready for a taste of my baking. I love these treats that you shared with us! They literally take just a few minutes to make which is delightful for me! Thanks for the ideas! These are so cute! My kids would love making these and I think they would be easy enough for my daughter. These are so cute! I pinned this I love how festive these are and I know kids would love to help make and eat these. Awe!!! Those are precious and it looks like you had a wonderful time together making them. I have never seen a tower like that but it looks like it would be super handy! These are so cute! 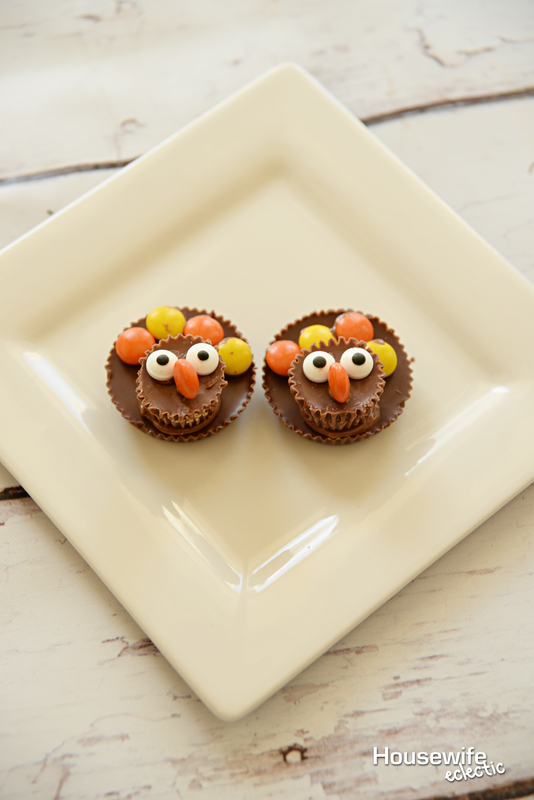 My kids would have a blast helping me make these cute treats for Thanksgiving. 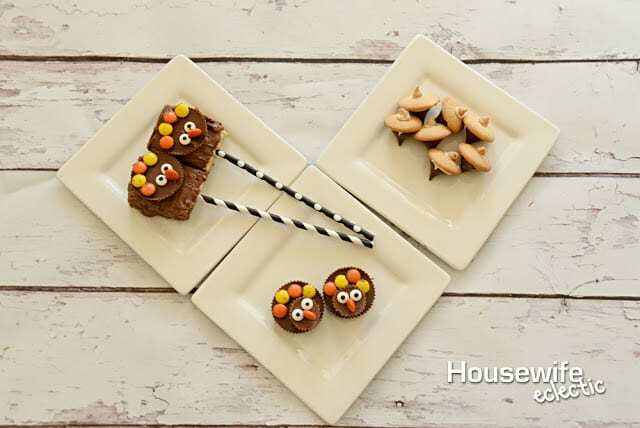 I never really think to make treats like this for Thanksgiving, but these are too cute not to. I now know what my kids and I are going to be making in the next couple weeks.